7822, Red Color, Hindu Cards. The front of this card has orange and cream border design and an image window with orange border having the paste-ups with the Ganesh ji image. 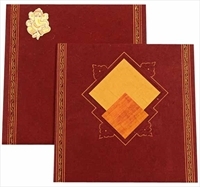 The interleaf has similar border design in gold and the envelope follows the front.